We’re getting stuck into some cooking this week to fill the freezer in preparation for school in a few weeks time. I hate more than having to think about filling lunch boxes every day so I try to have a variety of goodies in the freezer so that I can make the kids lunches with variety and without stress every morning. 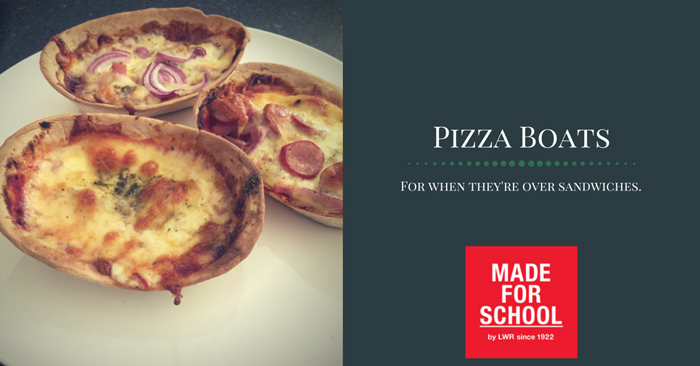 The mini pizza tarts were a huge hit in our lunch boxes last year but when I turned them into boats not only were kids thrilled but I enjoyed how much quicker these were as well. If you want to get started on some freezer cooking then grab the kids and their aprons and have some fun in the kitchen together. Pre-heat oven to 180 degrees and line a baking tray. Spread the boats with pizza sauce or BBQ sauce and top with your favourite toppings and finish off with cheese. Place in the oven for 15-20 minutes until cheese is melted and they are golden. Cool for 5 minutes on the tray and then transfer to a cooling rack. Enjoy them warm or at lunchbox temperature. Cook up a batch this weekend and hopefully you’ll have some left for next school lunches in a couple of weeks time.